Above: How not to play Catch-And-Kiss. I almost didn't include Assassin's Creed II in my list this year by virtue of the fact that I have only just finished it and that I was still in the process of writing about it, but there's no denying that it doesn't deserve a nod. Assassin's Creed II is a game rife with quality, with every aspect of it created with the overall experience in mind: The story of Ezio is fleshed out more cohesively than that of Altair's, making his desires for revenge more interesting and compelling; the fluidity of movement is more refined, allowing subtle yet effective maneuvers throughout the streets and rooftops that make up the game's cities; secondary quests and collectibles are tied into the main narrative, making them more fun to do or find, and less like a chore as a direct result of blatant attempts to extend gameplay; and the sense of place -- be it where you are within it, or the awe that stems from the beauty of the Italian Renaissance setting -- is a lot more fun to just be in, the discoveries leading to unexpected and fulfilling rewards. To put it simply it's hard to fault, making it a remarkable improvement on the original, but the praise stops there because, while it's impressive, it's also exactly what the first game should have been. I liked the original Assassin's Creed, loved it even, but it did have its flaws. 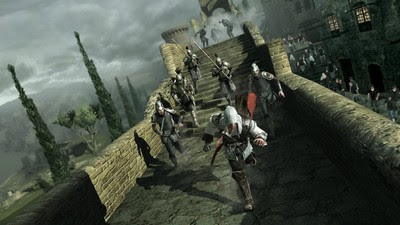 Assassin's Creed II fixes them, shows how enjoyable and fun the franchise can be, and not much more. As it stands, that's a good thing, but it's not the ideal thing. If it took Ubisoft two games to get their formula right, then let's hope it only takes one more to completely blow us away; to meet the incredible potential the franchise has; and to elevate the repution of the Assassin's Creed name to the level that the likes of Grand Theft Auto, World Of Warcraft, BioShock and Metal Gear Solid all share -- the absolute cream of the crop. That's what I would like to see. That is what I believe would be ideal.